Decorating bedroom at home can be a heavy task for some homeowners as your bedroom is a private space that you will spend most of your time to have full rest, sleep, and relaxation. This way you will need the appropriate bedroom furniture to shares all the warmth, style, comfort, and quality that you may expect. 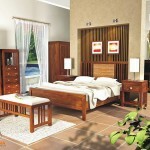 Have our wood furniture to adorn your lovely bedroom at the prices you will be joyful to afford. This category is the right place to conduct your search for the most appealing wooden furniture that can bring more value aside from its worth-grabbing shape.